After traveling across three countries in less than two weeks and then returning to the West Coast and winning the 100-meter freestyle on Friday, Nathan Adrian scratched the 50 free on Saturday at the Santa Clara Invitational Grand Prix. Adrian, the Bremerton native and Olympic champion, pulled out of the sprint event in the morning, leaving the door wide open for the rest of the field. 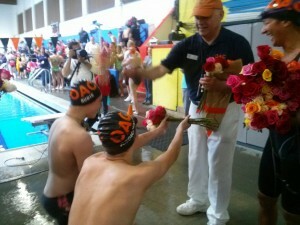 Adrian’s coach, Dave Durden, told swimmingworldmagazine.com it was a good time to give him a break after he swam nine 50s in nine days. Adrian swam in the Mare Nostrum Series, sweeping both the 50 and 100 free events in the three-city tour. Bruno Fratus of Brazil, who ranks second in the world, won the 50 free at Santa Clara in 21.45 seconds. Adrian is the fifth-ranked swimmer in the world with a 21.66 and it looked like the pair were going to go head-to-head from start to finish until Adrian pulled out. California’s Anthony Ervin was second followed by NYAC’s Josh Schneider in third. Up next will be the U.S. Summer Nationals Aug 6-10 in Irvine, California, which is also the selection meet for the Pan Pacific Championships later in August in Australia. Any thought Nathan Adrian would be hurting because of his transcontinental jet lag, guess again. Adrian, the Bremerton native and multiple Olympic gold medalist, won the 100-meter freestyle by a half-body length over Michael Phelps at the Santa Clara Invitational, an Arena Grand Prix meet, Friday evening. Adrian won in 48.17 seconds, just off the 48.08 he posted in the Mare Nostrum Series that had him in Monaco, France and Spain the last two weeks. Nathan was first at the split, 22.96 and stayed ahead the rest of the way. 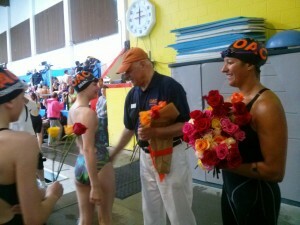 You can watch the video from swimswam.com here. Up next is Saturday’s 50 free. I’m guessing this will be closer, but Nathan will pull it out. I haven’t been wrong so far. BIDC members Cammy Rouser, Henry Sauermann, Jackie Hellmers and coach Chris Miller competed at the USA Diving Summer Junior Region 10 Championships in Santa Clara, California, earlier this month. 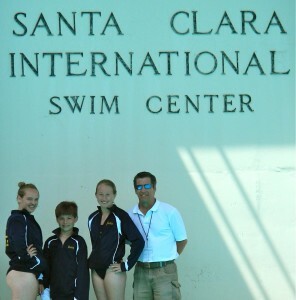 Three members of the Bainbridge Island Dive Club traveled to the 2014 USA Diving Summer Junior Region 10 Championships earlier this month in Santa Clara, California. The meet is the first step towards qualifying for the national championships. The top 12 finishers qualify for zone championships, and the top finishers from zones qualify for nationals. Henry Sauermann of Bainbridge qualified for zones on both the 1-meter and 3-meter springboards. Sauermann finished eighth in the 3M, under 11 category with a six-dive total of 114.75 points. He finished ninth in the 1M with a score of 113.65. Former zones and national qualifier, Cammy Rouser of Kingston and Jackie Hellmers of Poulsbo also scored personal best reverse dives. Rouser, competing in the 14-15 year-old category finished 31st with 188.45 points in the 3M and 29th in the 1M with 213.10 points. Hellmers was 44th in the 1M with a score of 145.85. The zone championships will be July 10-13 in Tucson, Arizona. Nathan Adrian has said that the Santa Clara Invite is one of his favorite events and it’s no surprise he’ll make do with some jet lag in order to race in his backyard. Adrian, Bremerton’s Olympic champion who trains and lives in Berkeley, Calif., is coming off a great sweep of the sprint freestyle events at the Mare Nostrum series in Europe. Adrian went 6-for-6 in the 50 and 100 free in Monaco, France and Spain. Not a bad way to spend a week or so. That being said, Nathan is all business when it comes to racing this week. The Arena Grand Prix Series event runs Thursday-Sunday. Thursday’s timed finals are at 4 p.m. Friday-Sunday’s preliminaries are at 9 a.m. with finals at 5 p.m.
Nathan is the top seed in the 100 free in 47.52 seconds, followed by Yannick Agnel of North Baltimore AC in 47.84. He’s seeded third in the 50 free in 21.47, behind top seed Anthony Ervin (21.42) and Brazil’s Bruno Fratis (21.45). The 100 is Friday and the 50 is Saturday. Also, here’s a link to Team Speedo’s latest video on Nathan. 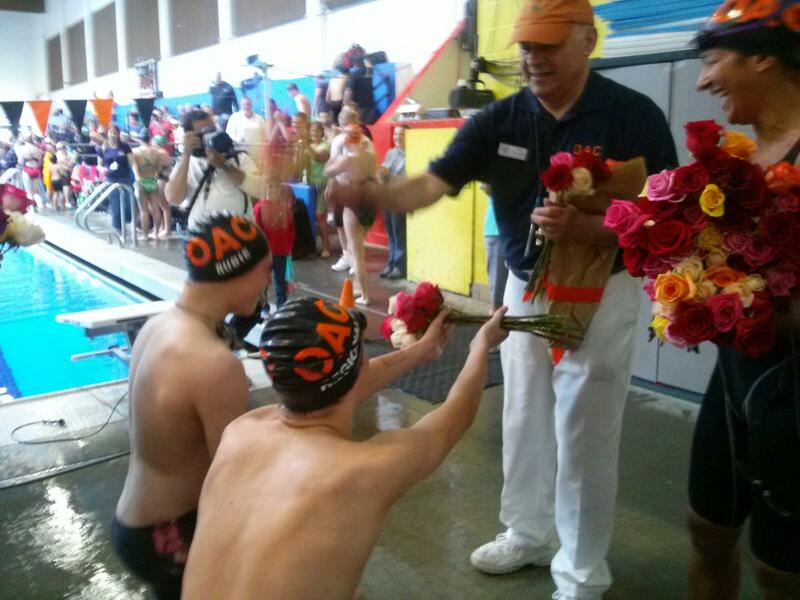 And, a story on Nathan and Janet Evans on the Make-A-Splash Initiative by the USA Swimming Foundation. Nathan Adrian claimed his third 100 freestyle title in the final leg of the Mare Nostrum series in Barcelona, Spain on Saturday. Adrian, who has won five events so far in the three-city European tour, posted an in-season best time of 48.08 seconds. The time puts him third overall this year in the world behind Australians James Magnussen (47.59) and Cameron McAvoy (47.65). Hanser Garcia Hernandez of Cuba finished second in the event in 49.05 followed by Andrey Grechin of Russia in 49.14. Next up is the 50 free. Nathan has won the other two splash-and-dash events in Monaco and France and will look to make it a clean sweep on Sunday. Like I said before, I wouldn’t bet against him even if the field is as tight as it is. Nathan Adrian of Bremerton won the 100 freestyle Saturday in Barcelona, Spain, at the Mare Nostrum series. Bremerton’s Nathan Adrian will look to finish off the final sprint freestyle events with two more victories in the Mare Nostrum Series Saturday and Sunday in Barcelona, Spain. Adrian, a three-time Olympic gold medalist, has won the first two legs of the three-city European swimming meet, sweeping the 50 and 100 freestyles in Monte Carlo and Canet, France. Adrian is seeded second in the 100 free in 47.84 seconds, behind Russia’s Andrey Grechin in 47.59. The 50 free is tight, with Florent Manaudou coming in as the top seed in 21.34, followed by Anthony Ervin in 21.42 and Adrian in 21.47. Cullen Jones is seeded fourth in 21.54, followed by Fabian Gilot, 21.75 and Russia’s Anthony Grechin, 21.82. Anyone of those swimmers can win the event, so it’s not a given Nathan will win all three stages of the series. But, I wouldn’t bet against him. Bremerton’s Nathan Adrian swept the second leg of the Mare Nostrum series with a win in the 100 freestyle on Thursday. Adrian, who is the defending Olympic champion in the event, won the freestyle in 48.43 seconds in Canet, France. Hanser Garcia Hernandez of Cuba was second in 48.77 and Konrad Czerniak of Poland was third in 49.07. Garcia Hernandez was the top seed after the morning prelims while Adrian was seeded third. Adrian won the sprint freestyles in the opening leg of the series in Monte Carlo. The series will move to the final leg on Saturday-Sunday in Barcelona, Spain. Olympic Aquatic Club will host a summer beach clean up in partnership with the Port of Silverdale. The clean up is June 27, from 11 a.m. to 3 p.m., at the Silverdale boat ramp. The club will meet at the boat ramp, and assign specific areas for clean up from there. All supplies needed will be provided by the port and they are providing a lunch to volunteers as well. If the weather cooperates, the club may have some open water races to conclude the day. Olympic gold medalist Nathan Adrian of Bremerton continued his dominance in the 50-meter freestyle with his second win in the event in the Mare Nostrum series on Wednesday. Adrian, who swims for Cal Aquatics, won the 50 and 100 free in the first stop of the series in Monte Carlo, Monaco, last week, and he cruised to the wall in Canet, France, in 21.68 Wednesday. He was the lone swimmer to come in under 22 seconds. France’s Florent Manaudou finished second in 22.00 and Anthony Ervin, Adrian’s training partner was third in 22.21. With his win Wednesday, Adrian has earned $1,258.59 so far in the three-city European tour. The 100 free is Thursday. The series concludes June 14-15 in Barcelona, Spain.